The Doctor, Charley and C’rizz are rats in the wheelwork, a threat to the schedule of a world where timing is everything. And the seconds are counting down to a fateful future that has already happened. Unless they can beat the clock. Paul McGann is the Doctor in Time Works. Time. It’s something all of us have and yet something we always want more of. work out than to catch up on Game of Thrones. We decide seven minutes of our life is more meaningful than arguing with an Internet troll. Time might be finite, but as human beings, how we spend it, save it, or waste it is ultimately our decision. What happens, though, when time is so fleeting that someone else judges how we’re using it? Time Works finds the Doctor, Charley, and C’rizz on a planet where the use of time is rigidly enforced; everything done in a certain way, at a certain time, to ensure not a single moment is wasted. A creepy first episode leads to a street-level view and a behind-the-scenes look of the society and the horrific motivations of the Clockwork Men. A strong script and great performances from all involved help make Time Works one of Eight’s best stories. Fritz Lang’s Metropolis meets Stephen King’s The Langoliers. That’s the best way to describe this story. Time Works is sure to conjure up these stories for anyone who’s seen or read them. Lang’s science fiction classic took a good, hard look at an industrialized society where the lower classes lived and died as they maintained the city above them. It also included the first robot in cinema history, the female gynoid Maschinenmensch. King’s novella shows the fate of the present becomes the immediate past, with the story’s namesake Langoliers responsible for keeping time…tidy. Steve Lyons, veteran writer of all things Doctor Who, contributes his third Big Finish script with this story. Following up on the superb tales The Fires of Vulcan and Colditz, Lyons moves away from historical settings to create a world very familiar to our own, both in setting, technology, and motivation. In the city of Industry, the clothing and buildings come out of the Middle Ages. But there are more modern inventions as well; mobile phones, computers, wristwatches, and the most horrific invention of all, bureaucracy. The society’s obsession with time is hinted at during the first episode, but driven home with full force later on in the story, as the Doctor finds himself without assistance, surrounded by people who won’t even spare a moment to listen to his pleas for help, lest they be deemed a “timewaster” whose “hands were idle.” Even losing four minutes is worthy of a visit from the Clockwork Men, who emerge from the clock tower to ensure that no time is wasted as the citizens are driven towards “Completion.” Behind the scenes stands a son who wishes to become king by any means necessary and make changes, and a king who wishes to retire, but his continued existence means that his importance towards Completion is mandatory. It’s an absolutely wonderful script that plays around with time. In some ways, this could have been a perfect story for the Divergent Universe. Imagine a society in the DU that discovered time and deemed it so incredibly precious that they will do anything to avoid wasting a single second of it. While Charley and C’rizz are trapped in the frozen second, they see the future and realize the secret of the Clockwork Men; subliminal whispers to the citizens of Industry to push and guide them along the correct paths while time is paused. With the means to deduce the most likely future actions someone will take, the gathered data (and there is always data to be gathered) is what guides the Clockwork Men themselves. So, who’s really pushing who along? Lyons and Edward Salt, who directed Thicker Than Water, work together like clockwork (unintentional pun!) to create Time Works, moving back and forth between the Doctor’s efforts in Industry to first understand and then overthrow the regime of the Figurehead (with a nice call back to the machinations of the Seventh Doctor and how the Doctor used to bring down corrupt societies as a hobby) and Charley and C’rizz’s adventures in the frozen moment and then later on in the heart of Industry’s bureaucracy. Everything moves as a logical pace, with each decision guiding the reactions of the Clockwork Men until the characters learn to turn those reactions back on their aggressors. There’s little wasted time in the script itself, although there are a few convenient moments where things happen just to happen, and there are plenty of false leads, red herrings, and characters disappearing and reappearing suddenly…but then again, who’s to say Time didn’t mean for them to happen? 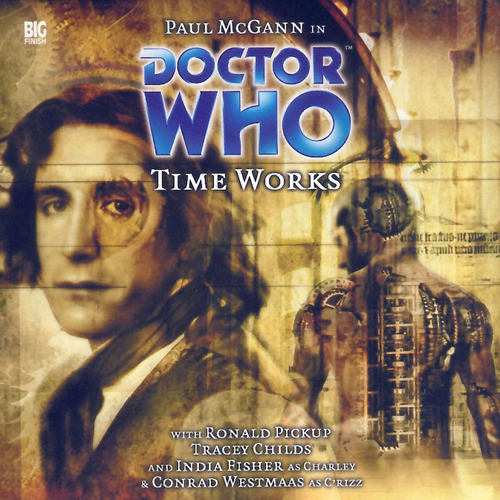 Paul McGann plays up the desperation in trying to rescue Charley and C’rizz before time passes them by, is inquisitive and caring when listening to Vannet explain the “rules” of Industry, and genuinely helpful when offering his assistance to the king. 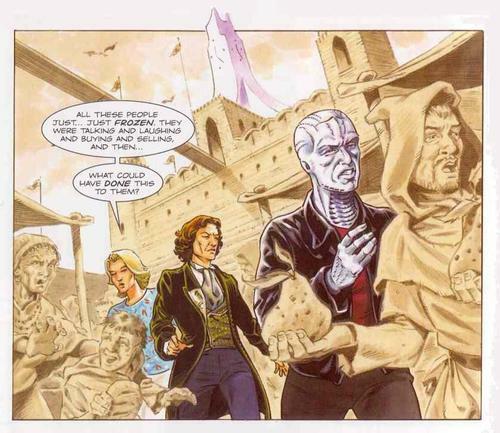 The Eighth Doctor is a Time Lord without a plan in this story, but he knows that as a Time Lord, it’s his job to help these people, as well as figure out what exactly is going on in this city regarding time itself. The improvisational nature of Eight is on display in Time Works as he tries several different plans; using a vortex shield resonator to block the Clockwork Men, offering to assist the king in an effort to avoid having his head chopped off, and repeatedly distracting the Clockwork Men and Zaneth in an effort to break into the clock tower…and then, when all is said and done, simply smashing equipment with a crowbar to bring down the Figurehead. McGann’s performance carries over the best aspect of his role from Other Lives. He’s a desperate Doctor, but instead of shouting and ranting, he’s doing his best to keep calm and puzzle out what’s going on. India Fisher and Conrad Westmaas spend most of the story together, as Charley and C’rizz are separated from the Doctor, captured by the Clockwork Men, and brought to a modern office building to be tested for any available jobs within Industry. Both of them have plenty to do in this story, making suggestions, being right and wrong, and fleeing in terror from the Clockwork Men, all while having faith the Doctor will find them. C’rizz’s slowly dawning understanding of time works to his advantage in this story as Westmaas plays him as kind of getting what’s going on, but focusing more on the big picture of trying to escape. C’rizz isn’t concerned with overthrowing the regime, but simply surviving, which ties into his chameleon nature (that, I need to point out, hasn’t been touched upon in…well, since it was originally brought up in The Next Life). Charley, though, doesn’t quite grasp the technological side of things, but she recognizes a bad hand when she’s dealt one. This is the most “Charley” India Fisher has been since Faith Stealer, a pure Edwardian Adventuress who does things per her own sense of right and wrong and refuses to give up, always looking for the way out for her and her friends. It’s nice to see Charley worrying as much about C’rizz as much as she worries about the Doctor, which HAS been brought up a few times since The Next Life. Want to go back in time a bit? How about Ronald Pickup, who played a physician way, way, WAY back in the First Doctor story The Reign of Terror? As Kestorian, the “king” of Industry, Pickup plays a man who’s tired, ruling by sheer inertia and vague platitudes about “completion” and “moving past the old world.” Adrian Schiller gets his Doctor Who start here as Prince Zanith, who wants to be king in order to make changes and save Industry by any means necessary, and what happens to the people of Industry during that time, meeting their fate at the hands of the Clockwork Men, is simply something beyond his control. One of the more debatable points of Time Works is that both men were responsible for letting their people die in the name of “Completion,” but at the end of the audio they escape any sort of karmic justice. This begs the question – if circumstances were beyond their control because of subliminal whispers to leave things as they were and the Clockwork Men acting while time was frozen, are they absolved of any and all blame because nothing was truly their fault? Tracey Childs, aka Doctor Elizabeth Klein from Colditz, is in the story briefly as the voice of the Figurehead, aka “Completion” given voice. Smooth, cold, and logical, the purpose behind Completion will give a listener chills, especially hearing Childs deliver the words. Merryn Owen plays Revnon, the hardest worker who clocks the most time and never lets anything or anyone affect completion, only to be declared redundant because of one simple non-action. It’s the classic case of someone working very hard, but never getting ahead because of the system being rigged against them. (This is where I’m contractually obligated to yell “BOOTSTRAPS!”) Philip Edgerley and Beth Vyse are the separated husband and wife who end up causing a revolution, both on the streets and in the office. Vyse’s Vannet is a good “story only companion” for the Doctor, with Edgerley’s Collis being very “this is my job, I don’t like it, but I’m going to do it well” mixed in with looking out for his wife, fudging the records to keep her safe, until the moment where he realizes he can stop the Clockwork Men by doing one very simple thing. With Andy Hardwick on music and Gareth Jenkins on post-production, the sound in Time Works is some of Big Finish’s best, from the lonely, frozen streets buffeted by temporal winds to the bustling market place, to the sterile office building to the grinding of the TARDIS’ engines as it tries to get back to the passage of time, and the sounds of the Clockwork Men (the act one cliffhanger with their introduction is particular effective). Big Finish also shows that it’s come a long way since The Sirens of Time with a rioting, frothing crowd that actually sounds like a group of angry people as opposed to three men saying “rabble” over and over again. The musical score is a simple violin piece, stripped down and hauntingly effective. And I shouldn’t forget to mention some damn fine cover art. Synopsis – Metropolis meets The Langoliers in a tale about ruthless time management that ranks as one of the Eighth Doctor’s best. 5/5. Peter Davison is the Doctor in…The Kingmaker. This entry was posted in Big Finish Review and tagged 5/5, Big Finish, Big Finish Audio, Big Finish Review, C'rizz, Charley Pollard, Conrad Westmaas, Doctor Who, Doctor Who Audio, Doctor Who Review, Eighth Doctor, India Fisher, paul mcgann, TARDIS. Bookmark the permalink.